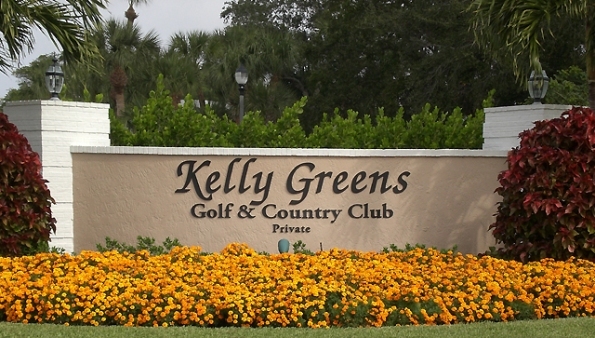 An established, gated golfing community located in the heart of Fort Myers, Kelly Greens combines golf and other recreational activities with the convenience of a Fort Myers address. This stylish neighborhood offers a blend of architectural designs from which prospective residents can choose their dream home. Custom villa and single-family homes in the Rutenburg tradition as well as veranda and beautifully appointed terrace condominiums provide options for all lifestyles. Approximately 85% of the homes at Kelly Greens have golf course or water views. This community was developed by US Homes in 1989. As a bundled community, all 939 home owners benefit from membership in a lavish country club and recreational facility. A 6,800-yard, par 72 championship golf course offers competitive play for all levels and is surrounded by graceful palms and home to a spectacular array of wildlife including Pelicans, Turtles, Egrets, Ibis, and Eagles. Driving range, practice green, completely merchandised pro-shop and private locker facility complete the perfect golfing experience.